As reported in Newsweek, in various food magazines, and in the pages of major American newspapers, the Heartland is being rediscovered—and along with it, wholesome Midwestern cooking. 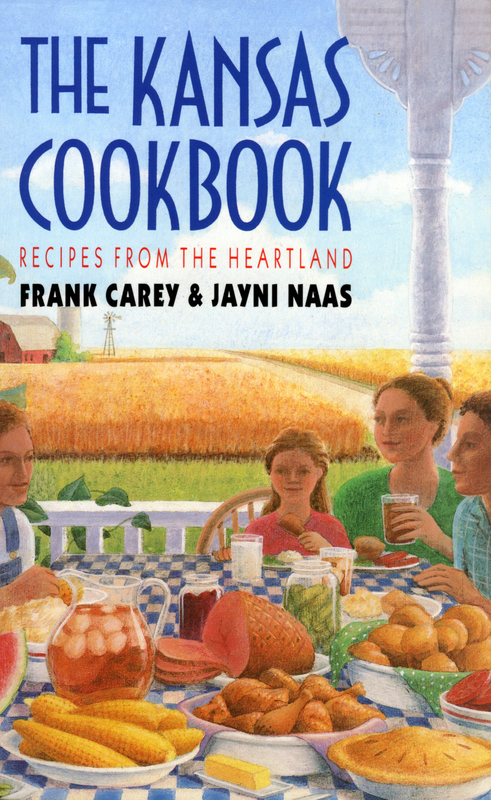 The trend, part of a larger fascination with regionalism, has led authors Frank Carey and Jayni Naas to a celebration of Kansas cooking. In The Kansas Cookbook, Carey and Naas present more than 400 delicious recipes that reflect the state's history, its ethnic diversity, and its agriculture. No more hot turkey sandwiches on Wonder bread or Iceberg lettuce awash in orange dressing—the stereotypes of Midwestern food—the recipes presented here include such tasty delights as morel mushroom turnovers, "cure-all" chicken soup, sirloin steak with midwest marinade, shepherd pie, Lou Belle's best-ever meat loaf, country-style ribs with barbecue sauce, Czech sausage, Parson's pan-fried chicken, fried pheasant, catfish grilled in corn husks, Drukla noodles, Bohne berogge, farmer's corn casserole, candied sweet potatoes, savory squash cobbler, German baked beans, sweet and sour cabbage slaw, black bean salad, Sunflower State whole wheat bread, oatmeal spice muffins, whole wheat buttermilk biscuits, apple butter, dandelion jelly, jalapeno pepper relish, pioneer apple pie, black walnut pie, Mennonite wedding cake, persimmon pudding, kolaches, Swedish ginger cookies—and much more! Many of the recipes have been contributed by more than 150 cooks from around the state and represent years of fine-tuning family favorites in countless kitchens. Others are Carey and Naas's innovative adaptations of historic recipes or new creations that make use of indigenous ingredients. All have been tested—and tasted. The food is simple, honest fare: no glitz, no razzle-dazzle, just good taste. Each recipe is accompanied by an historical note, a personal comment or reminiscence from its contributor, or a serving suggestion. The Kansas Cookbook is illustrated with nearly 100 line drawings by Robin M. Nance, a freelance artist living in Birmingham, Alabama. Food evokes memories of the past and inspires friendships. Now that the Heartland has taken its place in the culinary spotlight, The Kansas Cookbook is sure to bring many hours of browsing, cooking, and eating pleasure to all with a passion for good food. Frank Carey and Jayni Naas have been a team in the kitchen for four years, combining their cooking talents to create contemporary Heartland recipes. Both are award winning cooks: Carey has represented Kansas in the National Beef Cook-Off and the National Chicken Cooking Contest, and Naas was a grand prize winner in the 1987 Uncle Ben's Long Grain and Wild Rice 25th Anniversary Contest. They are the authors of The Easier You Make It the Better It Tastes, a collection of original recipes that emphasize good techniques, simple ingredients, and short preparation time.